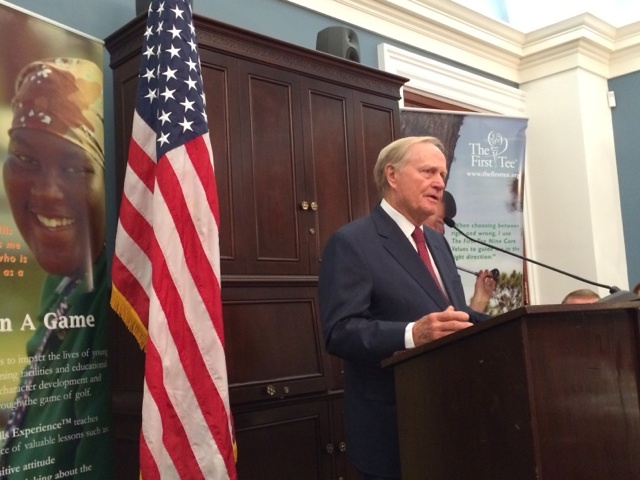 Jack Nicklaus met with Congress on behalf of the game’s booming industry in Washington, D.C., as part of the seventh annual National Golf Day, May 21 on Capitol Hill. Nicklaus joined We Are Golf, a coalition of golf’s top organizations, to host a day-long event to highlight golf’s benefits to the economy and charities across the nation. The game of golf is a $68.8 billion per year industry, creating 2 million jobs. Golf also has a $3.9 billion annual charitable impact, more than the NFL, MLB, NHL and NBA combined. The Golden Bear joined Congressional leaders at a breakfast to speak about The First Tee. Nicklaus is a Trustee of The First Tee, a program whose mission is to impact the lives of young people by providing educational programs that build character, instill life-enhancing values and promote healthy choices through the game of golf. In his comments to members of Congress including Speaker of the House John Boehner, Nicklaus said, “The First Tee is unique to golf, unique to youth development organizations, and it is having a meaningful and lasting impact on young people. “Golf and The First Tee provide young people role models at a time in their lives when role models are so critical. What I learned on the golf course many years ago is still important today and those same life lessons are the focus of The First Tee—how to set goals, how to overcome obstacles, how to respect the environment, respect my playing partners, and to respect myself,” he said. The Golden Bear concluded his comments by stating how proud he is to be associated with The First Tee. “I commend the many volunteers and coaches that work tirelessly in communities around the country to bring this program to life. This country will be in a better place because of The First Tee,” he said. Other participants in National Golf Day included industry leaders from the Club Managers Association of America, Golf Course Superintendents Association of America, National Golf Course Owners Association, PGA TOUR, U.S. Golf Manufacturers Council, The PGA of America, United States Golf Association, and World Golf Foundation. Discussion topics included golf’s economic, environmental, charitable and fitness benefits to Congressional, executive branch and agency leaders.